After having just learned about some of the many excellent ways in which you can collect information and bring content from anywhere into OneNote. Indeed, it might be, but I wanted to point out a few additional features that, depending on your work habits and needs, could come in really handy in your research work. Let’s start with side notes—the electronic equivalent of little yellow sticky notes that you can create with OneNote and position all over your monitor (see Figure 1). Figure 1. Side notes are mini OneNote windows that strip away the user interface, leaving you just enough space to jot down brief, important notes to keep in view during the day. These pages instantly become part of your notebook and can be used and searched like regular pages in OneNote. What’s the point of side notes? Quite simply, they are marvelous for keeping important lists, reminders, and reference information visible at all times while you work in other programs. You can keep less-important side notes in the background and pin the most important ones on top so they stay visible even over other windows. Unlike paper-based sticky notes, side notes come with all the benefits of a regular notes page in OneNote. You can format text, make lists, add pictures and screen clippings, add links, insert audio and video recordings, and tag important notes. Like all regular notes, side notes are automatically saved as part of your notebook, so that any information you jot onto them can be recalled again later and, if you like, be moved to the appropriate places in your actual notes. Have you ever tried consolidating all of your paper-based sticky notes in this way? Other than manually retyping everything, it just doesn’t work. 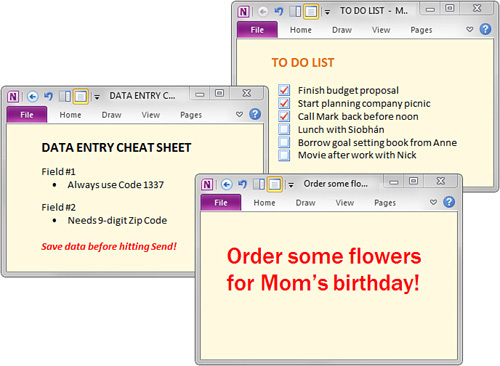 Only OneNote makes managing sticky notes easy by taking all of the work out of them. Using side notes is as simple as pressing a keyboard shortcut to create them. The canvas of a side note may appear smaller, but it works the same as a normal page in OneNote. Type some text, either for important reminders, daily to-do lists, or stuff you want to have on your screen at all times, and you’re set to go. The uses for side notes are as unlimited as those yellow sticky notes. In OneNote, however, they’re not only more convenient, but also much more environmentally friendly. On any page in your notes, on the ribbon, click View. In the Window group, click New Side Note. A small window with a yellow background appears. Like any notes page in OneNote, you can click this note and begin typing (see Figure 2). To quickly format its text, select it, and then make your choices from the Mini toolbar that appears. Figure 2. They may be small, but the pages behind side notes can be fully formatted—the same as regular pages in your notebook. For really important reminders, you can make the text large and stand out with color. If you have the OneNote Screen Clipper and Launcher running in your Windows taskbar , you can create a new side note more quickly by using its keyboard shortcut. Hold down the Windows key and then press N to create a new side note at any time, even if OneNote 2010 isn’t running. You can create an unlimited amount of additional side notes at any time—even while you’re in another program or another side note. Switch to the side note that you want to keep on top of all other windows. Click the View tab at the top of the small side note window. When the ribbon appears, click Keep on Top. The side note will now stay pinned on top of any other windows displayed on your monitor. To turn this option off again, click the View tab once more and then click Keep on Top again to turn the option off. Because side notes work like regular notes in OneNote, you don’t have to save them. They’re automatically saved for you the very instant they’re created. Side notes stay saved even if you click the red X in the upper-right corner to close a side note. Switch to any side note you currently have open. Click the Pages tab and then click either Previous Page or Next Page. Repeat step 2 until you find the side note you want. Alternately, you can press the Ctrl+PgUp (Page Up) keyboard shortcut to skip to the previous side note, or you can press the Ctrl+PgDn (Page Down) keyboard shortcut to skip to the next side note. To make things easier, all side notes are sent to a special section called Unfiled Notes, which is stored in the default notebook you created when you first installed OneNote 2010. Think of the Unfiled Notes section as your virtual OneNote junk drawer, where you can temporarily toss all of the random things you collect until you later have time to discard what you no longer need and organize what you want to put where it really belongs. As you use OneNote over time, you’ll likely create multiple notebooks in which to work and to keep a variety of information. If you want to change the default location of your Unfiled Notes section at any time, you can easily do so. Click File and then click Options. In the OneNote Options dialog box that opens, click Save & Backup and then click the Unfiled Notes Section path in the list. Click the Modify button to navigate to and then designate a different section as your Unfiled Notes section at the location you want. Until you’re more familiar with this special section and its uses, however, it’s probably best to leave things as they are for now. As with all organizational features that are available in OneNote, cleaning out your Unfiled Notes collection is entirely optional. Even if you never organize it, you’ll still be able to find everything stored there—including any and all side notes that you’ve created. As we’re on the topic of side notes, though, let me quickly teach you how you can access the Unfiled Notes section to view and review any side notes that you create.